Basically then, broth will contain the ingredients that are in bone. Covering and adhering to the ends of bones to form a joint, is cartilage. 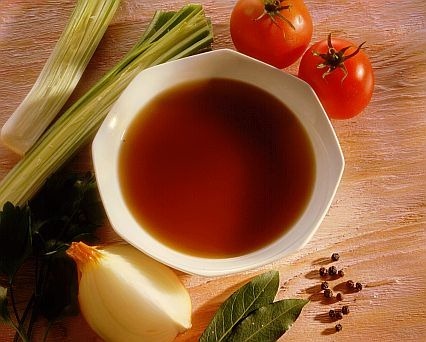 Therefore broth will also contain the ingredients that are in cartilage. Bone and cartilage are both classified as connective tissue. Connective tissue is one of the four basic tissue types that exist in animals. It functions to bind or hold together and to support and strengthen the body. Connective tissue consists of a matrix, and cells that secrete the matrix. The matrix is the material that fills the space between the cells and is therefore referred to as the extracellular matrix. It is composed of protein fibers, and ground substance, which can be a liquid, a gel or a solid. Since the cells are few, it is the valuable nutrients from the matrixes of bone and cartilage, which create the substance called broth.